The Evans Est-eem Sanitiser Trigger Bottle is an easy to use multi purpose cleaner and terminal disinfectant. This is a high quality cleaner that is proven to kill a number of bacteria from hard surfaces. Evans Est-eem Sanitiser Trigger Bottle is suitable for use on a range of surfaces including cutting boards, vending machines, kitchen equipment, shelves and walls. It is available to buy as a single product or as a bulk buy option. 4 Foot Lambswool duster for all those hard to reach areas. Domestos Bleach is a thick and powerful bleach that kills germs and bacteria. This bleach can be used for general cleaning use in both the home and the workplace. The benefit of using bleach for cleaning is that it kills all known germs including viruses, fungus, mildew and mould. This space efficient trolley comes complete with two built in trays to store all your cleaning products and a 100 litre vinyl bag for waste or linen collection. There is also ample room for storing a mop and bucket, vacuum or additional supplies at the front of the cart. 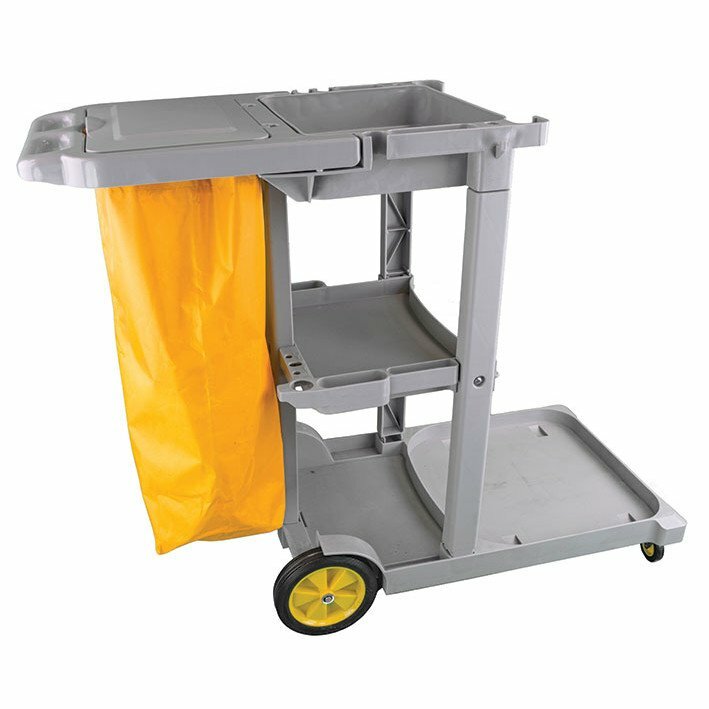 This is an all-purpose cleaning trolley that is ideal for all environments from schools and offices to hotels and colleges. Compact trolley, fantastic for areas with limited storage and comes complete with a Free 100 litre bag. If you have any other questions, please feel free to contact the Sales Team.